Chris just got his Bruiser back from the painters. It looks amazing. I gotta say it man, that’s some Phoenician royalty right there. Here’s a side story on that. The Phoenician’s were the first to create the purple, or violet dye. All of their kings were adorned in it and it became a sign of royalty. In fact, the word Phoenician, derived from phoinikèia, literally means “purple”. Now I’m not implying that Chris is royalty, but I love his art and this bike is molten lava. 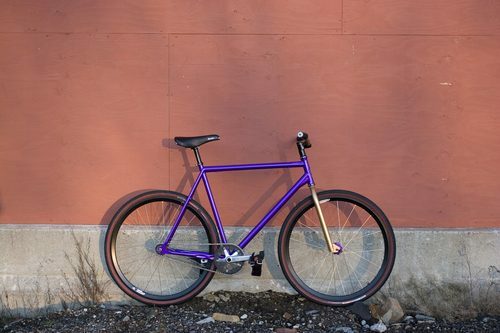 Chris bought all his parts from OPEN in Boston and the frameset from Milwaukee. It originally looked like this, but his buddy who works at MCR Autoworks in Clinton, CT wanted to paint it up for him. A few coats of high-end wet paint and this is the final product. 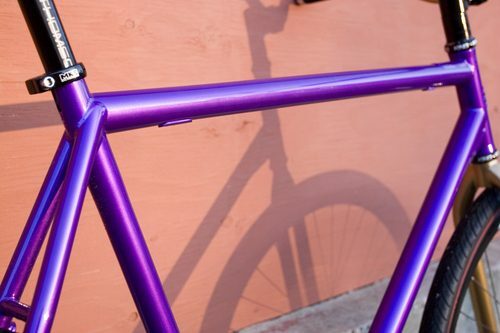 He painted the bars and fork gold and the frame a iridescent purple. Stunning man. Check out the full set here. Check out Chris’ artwork here and more pictures of Bruiser builds here.